Acceptance: Could This Be the Oasis We Seek While Grieving? One of the many self-care practices that I whole-heartedly recommend, especially while grieving is getting regular massages. As I was getting mine this week, the word acceptance came up during the session. When my massage therapist spoke the word, it felt like pure divine inspiration, leading the way to this blog post. What does acceptance mean to us on this road of life, this particular road where grief is in the drivers’ seat? For me it is a form of surrender to what is. Through surrender comes peace, through surrender we are shown “the way”. Peace is something that is inevitably lacking while we are grieving. As time passes we can begin to feel like peace is something that will never show its sublime face to us ever again. It can come in cycles giving a much needed respite at times from the ceaseless pain. During those times, we can feel like we have found a coveted oasis in the raging storm. But as a matter of course we get swept away, back into the sea of despair once again. What are we to do during these times? Our natural tendency is to fight the current which translates into resistance and struggle. What if we were to allow the the deluge of emotions to wash over us and maybe even engulf us for a time? How might that feel? In the moment probably not so great. However, in the wake of the flood of emotions that we have not resisted but have actually been invited to flow, we can find ourselves surrounded by peaceful waters, the calm after the storm. Grieving in this way, we are not hiding from our pain, we are not clutching and holding on for dear life; we are in the flow, feeling the full force of our feelings. Honoring all that is. You might ask: “How do I do this? I am too afraid that I will be swept away with the intensity of this pain.” It is so incredibly challenging to maneuver through these tangled emotions that envelop us during these times. My answer is that we breath, we breath, and we breathe again, we say yes, we accept, we surrender, we FEEL it, we live it! When we can do this we will find peace in the letting go, in the acceptance of what is, in that moment. What shows up for us in these moments is needing our attention, ultimately, needing our love. This will naturally take us to the next step, the next phase. Without this surrender and allowing, we can get caught and ultimately trapped in a holding pattern that will lead to stagnation with our healing process. This happens to all of us at times. It takes immense courage to dive into those troubled waters over and over again. It takes practice to develop trust in knowing we are always held in love. Trust that there is a way through, that we will not drown in the the depths never to be seen again. We are all held in Divine Love as we take each and every breath. We are never left alone to fend for ourselves. We are surrounded by life preservers. They show up for us in many forms, just waiting for us to reach out and grab one, two, three or more, the supply is endless. This is another way that we can encourage acceptance to reside within, acceptance that we are not alone in this, even when it feels like we are. So now, I pose this question. Could acceptance be the oasis we seek while grieving? In essence, I would say yes. We may notice it interwoven with a myriad of emotions throughout our process, possibly even for many years. It could be seen as one of the many tools that we can fully integrate, supporting us during this time. If we can grant permission for acceptance to permeate aspects of our journey, it seems to me that this would be an invaluable invitation. The end result could elicit healing and moving forward, creating the “new norm” filled with hope and possibility even in the absence of our loved ones. What do you think, could acceptance be the oasis we seek while grieving? I would love to hear your thoughts. Until next time, keep riding the waves of life! ~Let me know what you think. Simply scroll down to leave a comment or if you prefer to keep it simple you can click the LIKE button below. Also feel free to share on your Facebook page, just click on the blue Facebook logo below. 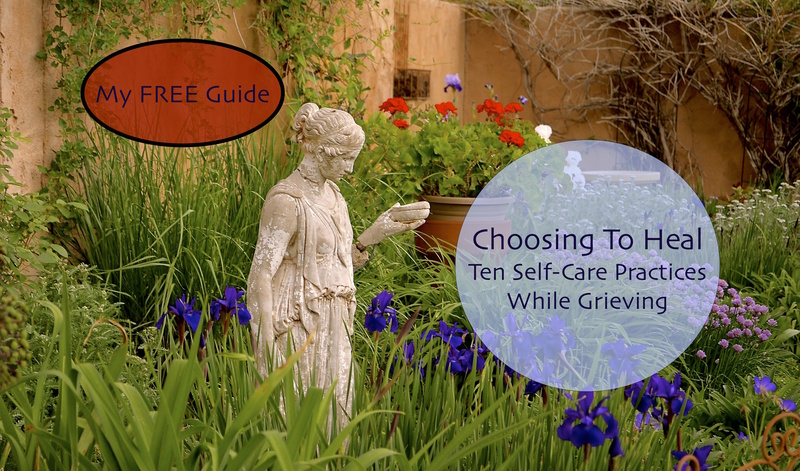 ~Get my FREE Guide: Ten Self-Care Practices While Grieving Guide and FOLLOW my blog with my latest blog posts delivered directly to your inbox. Click on the SUBSCRIBE button at the upper right side of this page or below, depending on your device. I am not sure why that is Terra? Maybe try again? It works for me when I click on the static button above, is that the one you used? Please let me know if you still have any problems. Beautifully written Kara! A wonderful message for those ready to hear. Especially well written, Look forward to your post as they help me when I am feeling low they help brighten my day.